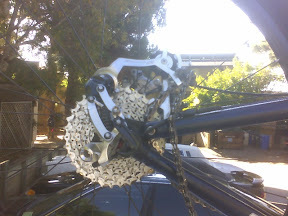 It must be because we get to ride in pristine redwood forests every single day, but we sure seem to get through a lot of derailleurs and hangers on our rides. Nicole holds the world record breaking at least 4 in the last year complete with hard to find Ellsworth hangers too. I broke an XTR rear derailleur that was less than a week old, what's worse was that we weren't even supposed to be there, we were lost and it was all my fault too. Don't be fooled that we're just a bunch of dorks who don't know what the limit screws are for, these were all legit sticks in spokes or hitting obstacles on the side of the trail. But the worst was yesterday, Erin came out for her very first ride with us and only the second ride on her new Blur and right near the end (whether she liked it or not it was going to be the end) of the ride, her jacket fell out of her pack and got caught up in her wheel and totally borked up her new derailleur. But as usual it's all fixed and ready to go and we'll keep on riding.